Last year, crypto-currencies burst on to the scene. Bitcoin saw incredible gains in 2017, rising from $1,000 all the way to $19,000 in mid-December. But regular investors have so far missed out on the cryptocurrency craze, as not only is the technology behind cryptocurrencies confusing, but the investment process is intimidating… or at least it used to be. Now investors looking to score on the crypto-currencies market in their regular brokerage account are in luck. Hashchain Technology Inc. (TSX:KASH.V; OTC:HSSHF) is a bitcoin miner and blockchain innovator with a wide exposure to a wide range of crypto assets. Buying into KASH is a bit like buying a crypto ETF: you get the value of the sector’s growth without having to invest directly in crypto... or understand this new asset class. Even with crypto prices falling from the incredible highs of 2017, bitcoin and its brethren are here to stay. Investors could use a firm like KASH to give them exposure. Plus, KASH is working on the future of crypto too... including proprietary regulatory software to bring greater security to those using it. In the highly profitable world of crypto, this is definitely a company worth looking at. KASH is first and foremost a crypto-currency miner. The crypto mining sector, which scarcely existed five years ago, has become multi-billion dollar industry. By mid-2017, crypto miners had earned $2 billion. But that was just the beginning. At the height of the crypto-boom in late 2017, miners had made more than $50 billion measured in value of cryptocurrencies then. That’s a 2500 percent increase in less than a year, although that increase has now fallen from peak prices. The top 25 crypto projects have provided major value gains for buyers of coins: the currency Verge, for example, delivered a return of 257,000 percent. In the last year, most cryptos have seen their value shoot through the roof. And investing in KASH is a great way to get crypto mining exposure. Investing in crypto mining is like investing in a gold mine: the miner delivers product, deducts costs and delivers a return. But even gold miners have only been able to deliver an 11 percent return in the last year. Crypto miners like KASH could make gold mine returns look miniscule. The company has big ambitions and intends to dramatically scale up its operation. Right now, KASH has 870 mining rigs, and the company has a commitment for mining up to 20 MWs in a facility in Montana. The company is also set to purchase an additional 5,000 rigs. Combined with its current rigs, KASH should be able to mine 8.7 MW. To put that in perspective: when the crypto-miner Hive started out, they had a capacity of 4 MW. The company positively exploded late in 2017, and for a time had a market cap of $1 billion. When KASH scales up, it could be the biggest crypto-miner in the business. It has a market cap of $45 million, but once its committed Montana facility space is fully utilized it should be able to mine 20 MW. But that’s not all its got going for it. With literally dozens, if not hundreds of currencies out there, new-to-crypto investors often feel overwhelmed... or don’t have the time to research the variety of cryptos available to invest in. Owning KASH (TSX:KASH.V; OTC:HSSHF) could be a solution to that problem. So, not only do they provide mining exposure... but they also provide exposure to tokens too. The company has holdings of the Dash cryptocoins, now worth a lot more than KASH paid only a few months ago. A key currency in the company’s portfolio is Dash. The company also owns a Dash “masternode,” which KASH acquired after a $280,000 investment in 1000 Dash Coins (which is now worth $560,000). The Dash network currently rewards masternodes at a rate of 6.67 Dash per month. That gives KASH a steady stream of income. Ownership of a rare masternode has been giving KASH a return on its masternode investment of 8 percent. Dash is a smaller currency but its growing fast. 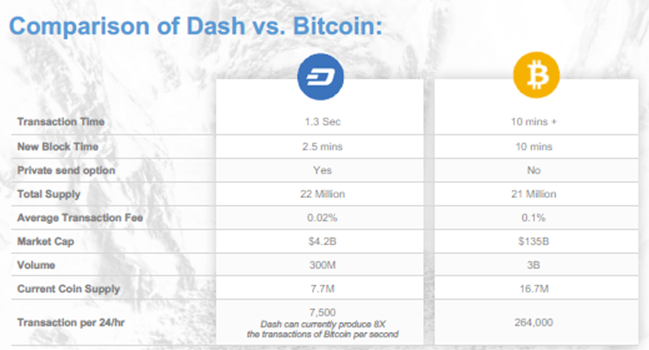 With a market cap of $4.2 billion compared to Bitcoin’s $135 billion, Dash is being produced at a rate 8x that of Bitcoin. Greater processing power for Dash means that Dash transactions happen in a matter of seconds. It can take several minutes to process a transaction with Bitcoin. The leadership at KASH knows the Dash crypto-currency well, and is prepared to capitalize on it. Perry Woodin, the head of the KASH advisory board, also sits on the advisory board of Dash and has more than 20 years of experience in managing web-based applications. CEO Patrick Gray is a tech pioneer. He sold his first start-up to Xerox for $220 million, and he’s raised millions for a number of successful ventures. Ownership of mining, the Dash masternode, as well as a planned diverse portfolio of other cryptos, gives KASH a solid base and strong prospects for profitability. KASH recently announced the acquisition of the business of Node40, an experienced blockchain firm, for approximately $8 million in cash and stock consideration. Node40 is a crypto-currency exchange management software that delivers up-to-date information on the changing state of crypto. Regardless of changing prices, Node40 will give KASH an edge on navigating the crypto market. The company’s stock in some ways functions like an ETF for crypto-mining: investors will get exposure to a valuable index of crypto-currencies, without taking on the risk of picking and choosing specific volatile coins. And things may only get better from here. After years of scoffing at Bitcoin and other crypto-currencies, the financial industry is finally paying attention. In 2017, there were at least twenty-seven “unicorns,” or billion-dollar start-ups in the financial technology or “fintech” sector. PwC reports that major financial firms are partnering with fintech companies at a higher rate than ever before, hoping to harness new technologies to lock down more business. Blockchain and crypto-currency form an important component in the fintech revolution. The opportunities for investors grow greater and greater every month. In December, Bitcoin futures were launched on CME, the world’s largest futures exchange. Futures also began trading on Cboe, another large futures exchange, and it may not be long until it debuts on the Nasdaq. There’s talk of crypto-currency hedge funds, particularly one featuring Ripple, one of the most competitive cryptos. Pretty soon, crypto-currencies are expected to be integrated into the financial system, to the point that everyone (including the reader) will have a stake in the blockchain of cryptos. But while Wall Street wakes up to the potential of cryptos, KASH offers exposure that is not available in most other single companies. That’s because KASH, unlike other crypto firms, wants to be part of the coming regulatory landscape. KASH (TSX:KASH.V; OTC:HSSHF) is quickly establishing itself as a provider of accounting solutions for Blockchain. Through its recently announced acquisition of NODE40 the company is focusing on developing accounting software that can integrate directly with the crypto market with certain major cryptocurrency exchanges. The company’s goal is to bring blockchain and crypto-currency up to the regulatory standards enjoyed by other parts of the financial sector. And regulation is something the crypto market is going to need. For example, last year, the IRS subpoenaed information from Coinbase regarding transactions it processed for 14,000 Coinbase users. It’s only a matter of time... and KASH is building software that can help keep users compliant. There needs to be a company like KASH that takes regulation seriously. And KASH has acquired proprietary software that analyzes the blockchain to determine accurate valuations for every input and output comprising a transaction. Once a value has been assigned to every transaction, the service can report the current total asset value, income, and any realized gains or losses. This will help keep crypto markets regulated, preventing fraud. Think of this aspect of the company’s business like Quickbooks for bitcoin. Investing into a smart, responsible and ambitious firm like KASH (TSX:KASH.V; OTC:HSSHF) gives investors exposure to the red-hot world of crypto-currency mining, software and hosting. The company’s stock is like a crypto basket: as the firm’s profile grows and it diversifies its holdings, KASH could function something like a crypto ETF, offering investors the diversity of different aspects of the crypto market. If KASH reaches full capacity at its Montana facility, it will be mining crypto at rate of nearly twenty-thousand MW per year. At current Bitcoin market value for Bitcoin mining revenue, that could translate into $200 million in annual revenue. All for a firm that has only a $45 million market cap. KASH’s acquisition of Node40 will allow it to navigate the choppy waters of the crypto market. Regardless of the fall in prices, the number of crypto transactions are on the rise, which means that investors will need a firm with KASH’s skillset to navigate the new economy. Once you throw KASH’s proprietary accounting software into the mix, the potential starts to look really appealing. Demand for regulation in the Bitcoin market is likely to shoot up in 2018 as Wall Street embraces the crypto revolution. That means that a company like KASH with its own crypto regulation software could charge a premium for its services, especially if it becomes the industry standard. Considering the value of the whole crypto-currency market is currently about $640 billion, KASH’s regulatory software could eventually be worth a lot more than it is now. In short: KASH (TSX:KASH.V; OTC:HSSHF) provides smart wide exposure to the crypto market... from mining... to cryptocurrencies... to crypto assets... and software... right in your stock trading account. SHARE OWNERSHIP. The owner of Safehaven.com owns shares of this featured company and therefore has an additional incentive to see the featured company’s stock perform well. The owner of Safehaven.com will not notify the market when it decides to buy more or sell shares of this issuer in the market, but will not trade on material information that has not been disclosed to the public. The owner of Oilprice.com will be buying and selling shares of this issuer for its own profit. This is why we stress that you conduct extensive due diligence as well as seek the advice of your financial advisor or a registered broker-dealer before investing in any securities. PAST PERFORMANCE IS NOT INDICATIVE OF FUTURE RESULTS. Investing is inherently risky. Don't trade with money you can't afford to lose. This is neither a solicitation nor an offer to Buy/Sell securities. No representation is being made that any account will or is likely to achieve profits or losses similar to those discussed on this web site.